Raffigurar Narciso al fonte is a quintet for flute, alto flute, two clarinets in Bb and piano. The piece is by Salvatore Sciarrino, written in 1984. When listening to the piece, the first things that comes to mind are echo and reflection, these elements create the quintet’s main characteristics. To understand the purpose of these elements, and analysing the piece in general, it is necessary to understand the title, which refers to the myth of Narcissus. In brief, as a punishment, Narcissus was made to fall in love with his own reflection. “Raffigurar” means in this context the “representing” or “portraying” of Narcissus as he admires his own image. Before going deeper into how Sciarrino constructs the overall image of the piece, I will start by introducing the instrumental techniques and other elements. Like commonly in Sciarrino’s music, the use of different techniques is used sparingly. However, the used techniques and elements are implemented in every possible way one could imagine, creating what could be perceived as a very well recycled piece. Raffigurar Narciso al fonte displays the following elements and techniques: Harmonics, multiphonics, glissandi, clusters, monotonous figures, and rapid figures. In the woodwinds, these playing techniques are always either performed with a very wavy vibrato, or in a very straight manner, creating contrasts and richening the texture. The harmonics occur in all voices and are implemented in various ways; in long monotonous figures (Figure 1), in a muted manner on the piano, encouraging the flow of overtones when the pedal is released (Figure 2), as wandering between the diverse natural overtones of the same fundamental (Figure 3), and in short, wavy incomes (Figure 4). Figure 1: Long, monotonous figure in clarinet 2. At first to be played without, then with vibrato. Figure 2: The use of harmonics in the piano, occurring with the release of pedal. Figure 3: Harmonic volatility of the fundamental in the flutes. Figure 4: Short, wavy income in the flute. The multiphonics are portrayed in the voices of the clarinets in the form of long, steady, dynamic-changing figures. Even though the pitches are always the same, boasting a minor 3rd from F to G# (sounding pitches), the multiphonics earn their variations with the use of diverse dynamic-changes and length. 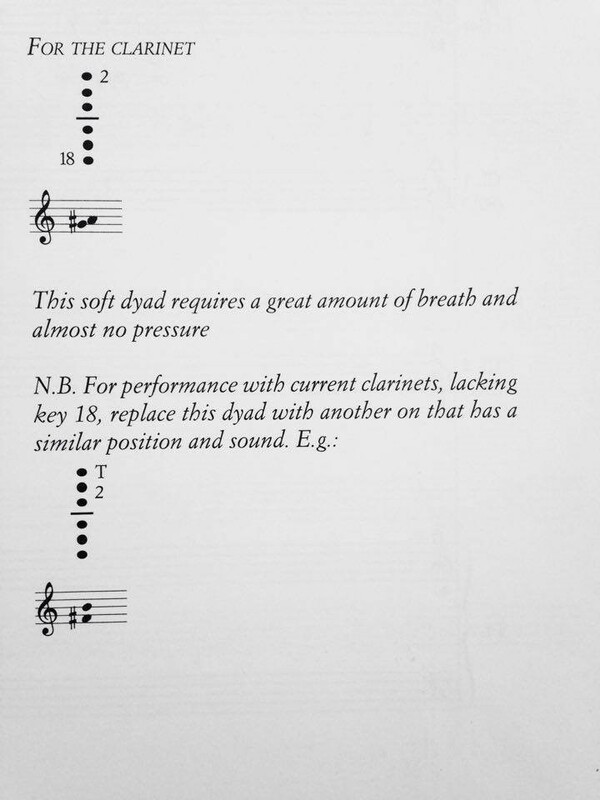 Just as in Lo spazio inverso, Sciarrino gives a different multiphonic-option for clarinets lacking the 18th key: a replacement that he refers to having similar position and sound (Figure 5). Funnily enough, the replacement option given, contains a multiphonic of a perfect 4th, from E to A (sounding pitch), whose effects must be considered rather different from the prior one. 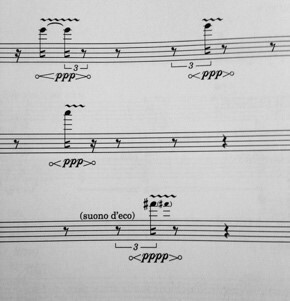 However, I have only heard the piece with this replaced multiphonic and cannot imagine it in any other way. The glissandi occur in the flutes and always span a minor 2nd up or down, as is a natural limit of the instrument. On the one hand the glissandi are presented in a very gentle way, in the end of a wavy tone, occurring as it diminishes to niente (Figure 6). On the other hand, they are presented in a steadier manner lacking any sort of dynamic changes, zig-zagging between the two flutes, almost reminiscent of sirens (Figure 7). The third glissando method combines the two, that is to say a zigzagging manner between the voices, but now occurring with diminishing dynamics (see Figure 8). Figure 5: Multiphonic information in the explanations for the piece. Figure 6-8: Different display of glissandi in the flutes. There are also glissandi in the piano, that run rapidly through clusters in a quite aggressive way (Figure 9). However, the more commonly used clusters occur in a simultaneous stroke of the pitches within them (Figure 10). The piano also employs elements of very rapid figures, at points reminiscent of water splashes (Figure 11). Figure 9-11: Rapid cluster glissandi in the piano, clusters, and rapid figures. Eventually, the monotonous figures of the piece have to be noted. These are always applied with some sort of dynamic changes and appear both in shorter and longer values. Their overall manifestation is what creates an echo effect in the piece. What mainly characterises the piece are these monotonous elements applied through triplet-moving figures, refined with a wavy vibrato (Figure 12). 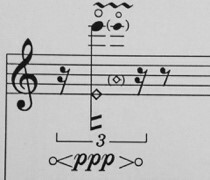 In the flutes, this technique relates to the harmonic timbral trills Sciarrino is well known for. However, in this case the wavy harmonics’ texture does not seem as rich as the one of harmonic timbral trills, possibly caused by the lack of perfect 4th volatility. Figure 12: Short wavy figures in woodwind, mainly appearing through echoing triplets. The use of these techniques and elements creates some clear contrasts in the piece, explicitly the long steady tones or multiphonics, the whispering, wavy, rather short harmonics, and the aggressive rapid figures of the piano. Various movement can be found in Raffigurar Narciso al fonte. For instance, there is the movement of triplets, mostly applied in a non-rhythmical way. On the other hand, this movement gets more rhythmical as the triplets and their content condenses. The movement of figures between the voices can seem like a ball which the different instruments throw between each other in a manner of counterpoint. When zooming into this motion, repetition comes to mind. The repetition of the musical elements and techniques of the piece, and how this repetition is elaborated, is what in fact creates the sense of echo and reflection, serving as the main characteristics of the piece. To begin with, the echo comes and goes from one direction to the other, but as the piece develops, the movement of echo can travel to and from several different directions. The same applies to Raffigurar Narciso al fonte as so many other of Sciarrino’s pieces, the exact use of pitch is in fact of no great importance, theoretically speaking. However, the way he implies pitch is from the perspective of the specific atmosphere he is aiming to create. 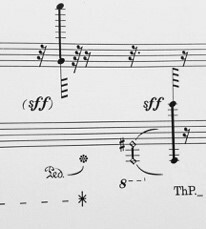 As mentioned below, the piece initiates with a unison on E. It is of course difficult to tell if the reason for this exact pitch is of some great value, but as a listener, I perceive it as an invitation to focus on the echoing atmosphere presented to us, rather than some sort of a key to understanding the pitch theory of the piece. This is why I have chosen not to go further into the implement of pitch in the piece, except from when I think it is of value for the explanation of the piece’s structure. As concerning the dynamics of the piece, it is, just like its pitches, used to promote the atmospheric matters. There are not any surprises in their way of occurring, very much corresponding to the style of Sciarrino. 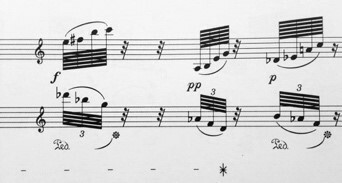 For instance, crescendo and diminuendo to and from niente, contributing to his common streaming, transparent sounds (referring to every element and technique of the piece, except from what occurs in the piano part), sudden sf used as rupture or highlighting, et cetera. With “scurrevole” (E. sliding/flowing) being the only given description, the piece initiates with the flutes seesawing together in unison on E, both as harmonics and ordinary pitches, in an echoing, whispering, streaming way. 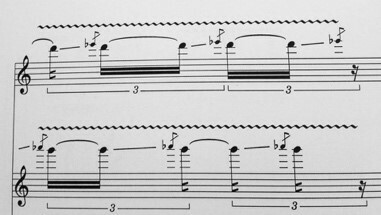 The 1st clarinet joins, marked with “(suono d’eco)” (E. sound of echo) also in unison. The movement of this seesawing echo is mainly in the form of triplets, providing a very non-rhythmical tempo, where the only focus is on the echo moving between voices, at times joining together, strengthening the whispering wavy effect. The next subdivision is approached with a minor 2nd between the two flutes. This marks a certain end to the unison section of the beginning. This is followed by a new material in the 1st clarinet, an E-harmonic marked with “lontano, etero” (E. far, straight) and a crescendo from niente, reaching a più p poss., and diminishing to niente again. As an addition to the musical content, the first bend-note glissandi emerge in the flutes. Out from these events, more pitch branches reach out and the intervals between the voices become wider in register. The material that has appeared so far continues to vary through a few subdivisions of 1 until section 2 is reached. What appeared as long, steady, but gentle figures in the clarinet, at this point gains a heavier weight. As a general character of these figures, they now move between voices with no other ongoing elements. Contrasts can however be found within these sections, simply implemented with or without vibrato. The echoing effects of these figures are even shown with dashed lines between voices, leaving no room for any other significance (Figure 13). After this statement, the triplet figures that are now familiar to us, start occurring in the flutes while the steady figures highlighted in the beginning of section 2 continue in the clarinets, with the same internal contrasts as before, creating a sort of 2+2 counterpoint movement. Figure 13: The movement of long, monotonous echo. This section starts with an accelerating triplet figure in the 1st flute occurs, something the ear expects that rhetorically will lead to something, and so it does. 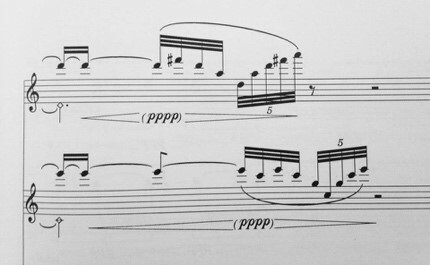 The piano with its short, rapid figures of what can be perceived as random pitches is introduced in pp, yet seeming rather aggressive with regards to prior events. This income triggers triplet-moving echoes, yet mixed with the steady, monotonous, long figures. Although these elements are known to the ear technically speaking, they are no longer in the form of a balanced seesawing between yin and yang but fading consequences of a new and stronger factor. After a while of this ongoing echo of the different materials displayed in diverse combinations, it becomes clear to the ear that the reflection of echoes between voices has become much more complex than in the beginning, and is now moving both more rapidly and to and from more than one direction and voices at a time. That is to say there is no longer one energy release that triggers the next, but a multiple system of triggers acting simultaneously. As the section continues, the long, steady monotones are varied with multiphonics in the clarinet, infecting the flutes to play long, steady, monotonous harmonics, leading to what could be perceived as artificial multiphonics. As an appendix to these “artificial multiphonics”, their pitches are used as fundamentals for an overtone volatility that gives the piece an even more refined tint. In section 4, the piano triggers much more exaggerated bend-note glissandi in both flute voices. As a consequence, multiphonics varied with wavy monotonous passages take over the voices of the clarinets. For a while this is portrayed in a 2+2 counterpoint way, with distortions from the gradually more aggressive and condense piano part, ending with an almost four octaves chromatic cluster, marking the end of this section. The fifth section starts with a similar cluster, even more aggressive than before due to its rise in register. At first this doesn’t seem to have a great effect on the other voices which now remind us of the simpler echoing from the beginning. But Adam was not long in paradise, and soon the piano triggers the flutes to display some very rapid aggressive ff harmonics (written as multiphonics, but sounding like monotonous overtones). The clusters continue, the clarinets are steady and the flutes regain their calm echoing from the beginning of the section. Here, a new set of variations is put together. The piano part displays the aggressive clusters, the rapid figures, and the muted harmonic-causing clusters. The flutes now contain the rapid aggressive ff harmonics from the prior section, combined with the harmonic volatility caused by each fundamental held. This results in streaming, short monotonous figures, as well as the occasional bending of notes, while the clarinets boast the familiar multiphonics. Suddenly, something rips the ear; extremely aggressive clusters of glissandi in the piano, giving a new aspect to the piece. The elements of this section are then varied, until the aggression dies out, and leaves us with very short rapid figures in the piano, long multiphonics in the clarinets, and the surreal harmonic wandering in the flutes, ending in a strange C major passage. One day Narcissus was walking in the woods when Echo, an Oread (mountain nymph) saw him, fell deeply in love, and followed him. Narcissus sensed he was being followed and shouted "Who's there?". Echo repeated "Who's there?". She eventually revealed her identity and attempted to embrace him. He stepped away and told her to leave him alone. She was heartbroken and spent the rest of her life in lonely glens until nothing but an echo sound remained of her. Nemesis, the goddess of revenge, learned of this story and decided to punish Narcissus. She lured him to a pool where he saw his own reflection. He didn't realize it was only an image and fell in love with it. He eventually recognized that his love could not be reciprocated and committed suicide. In a larger context, Raffigurar Narciso al fonte can easily be connected to the story of Echo and Narcissus. Therefore, analysing the piece without referring and connecting to the myth can seem rather useless. Initially, we might find ourselves in the forest, where the woodwind dreamily moves in echoes, creating a surreal atmosphere, interpreting how Echo follows Narcissus and the question of echoing conversation: “Who’s there? Who’s there, Who’s there?…”. This leading to the destiny of Echo, Nemesis revenge plan, Narcissus’s seduction to the pool, his love for his own image, and consequently his death. However, it makes more sense when referring to the title of the piece itself, that the musical subject begins when Narcissus is already by the pool, because the title refers to that exact condition. In that way, the seesawing wander between instruments could portray his admiration of his own reflection, where the perspective rocks between Narcissus and his mirror image, still promoting the characteristics of echo. The wavy vibrato affects almost everything played by the woodwind, gaining a new significance, as one imagines them capturing the wet wavy texture of Narcissus’s reflection. For a while, everything runs smoothly, but eventually Narcissus realises that things are not like they ought to. Maybe the wavy vibrato even depicts the motion of Narcissus stretching out his fingers with the aim of touching his loved one, but with no other result than ripples and small waves occurring on the water surface. I imagine that the first income of the piano refers to Narcissus perhaps accidently colliding into his own image, or maybe a conscious act of reaching out to his loved one, resulting in a splash of water. He tries not to pay any attention to the unbearable thought of his feelings perhaps not being reciprocated. This is displayed by the reoccurrence of prior elements, stated in the third section, but with a slightly more imbalance and seriousness than their initial representation. The seesawing is in some way not as natural as before, but in addition, the ear simply perceives them differently after the income of the piano. One part of Narcissus can certainly not bear the lack of confirmation to his sufferings, at times bursting out in decreasingly cautious water strokes, simultaneously increasingly confirming his worst of fears, the harmonic volatility of the flutes in the end of section 3 not only serving as an end to the section, but also as a final confirmation of Narcissus’s doubts. Section 4 and 5 both contribute to the building up of Narcissus’s horrors, the echo and reflection is no longer light and dreamy, but infernal and shrieking, as implied in the woodwinds, referring to Narcissus’s realisation of his own inevitable destiny while he beats the water surface with his fists, maybe even his head, with gradually increasing desperation and uneasiness, as the use of musical content in the piano implies. Section 6 demonstrates how Narcissus realises he must die. At first his outrageous overwhelming feelings of anger and despair are portrayed in the aggression from the piano stretching its wings to the flutes’ characteristics that consequently become more brutal than before. 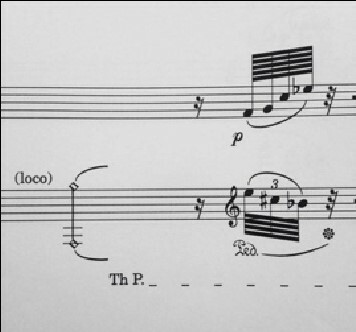 Subsequently, Narcissus accepts his own death, this implied by the harmonic volatility, that seems to have some role as a realisation of the unavoidable in the piece, when comparing the use of the technique now and in the end of the third section. Does the piece end before Narcissus’s death? Does it interpret his actual bane? Does he starve himself to death? Does he eventually drown in his own image? The latter would of course, aesthetically, symbolically and rhetorically, make the most sense, but Sciarrino is consistent to himself and does not reveal too much. If the story’s content is to be referred to the piece as above, the form can in fact be only a musical manifestation of the myth’s narrative. 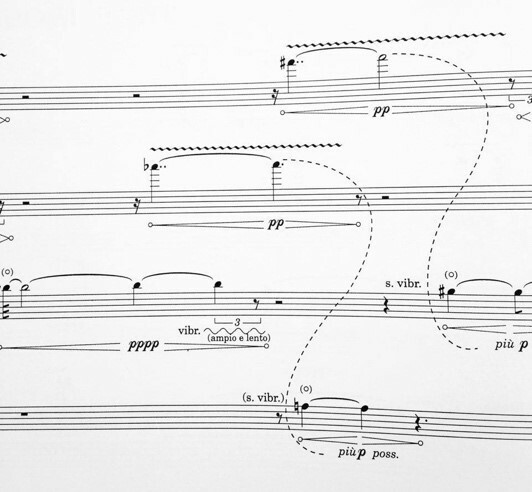 First and foremost, in his piece Raffigurar Narciso al fonte, Sciarrino shows how he neatly presents the act of echo and reflection using his refined musical language, combined with his philosophical and poetic way of thinking, as seen when realising the myth’s narrative within the piece itself. Every aspect is presented with a modest and organic approach, recycled in the way of every possible variation. This must lead to an environmentally friendly result, although the exact kind of result remains uncertain. Salvatore Sciarrino. 6 quintetti: Raffigurar Narciso al fonte, Casa Ricordi, Milano, 1996. 1Salvatore Sciarrino: 6 quintetti: Raffigurar Narciso al fonte, Casa Ricordi, Milano, 1996, p. 16, 2nd system. Ibid, p. 17, 2nd system. Ibid, p. 19, 2nd system. Ibid, p. 14, 2nd system, p. 27, 1st system, p. 27, 2nd system. Ibid, p. 24, 2nd system, p. 23 2nd system, p. 21, 2nd system.